With Sumo Logic's powerful data analysis tools behind it, the app simplifies and improves O365 audits by providing clear, searchable trails of user activity. 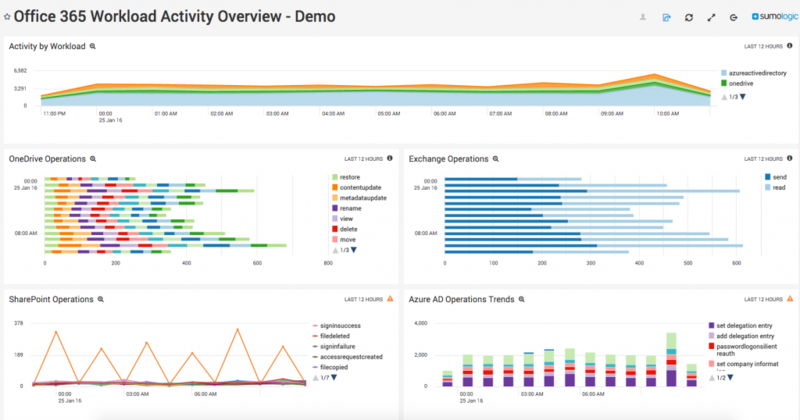 The unmatched anomaly detection and the depth of real-time analytics from the Sumo Logic app helps you improve the security of your O365 integration. Accelerate your O365 troubleshooting with comprehensive problem tracking through the Sumo Logic App. Quickly trace and resolve issues to resume productivity. Microsoft Office 365 is a versatile suite of business-oriented applications that is commonly used by many organizations. It provides popular cloud-based software applications, such as Word, Excel and Powerpoint, that allow people to easily share and collaborate on spreadsheets, documents and other content. By collecting and analyzing data from Office 365 using Sumo Logic's log analysis app, you gain a deep understanding of how your users interact with the diverse O365 apps. The valuable information provided by the real-time analytics helps optimize your Office 365 integration for both security and compliance purposes. The Sumo Logic App for Office 365 provides a unique level of insight for organizations that rely on Microsoft’s popular productivity platform and simplifies Office 365 application monitoring. The app also facilitates improvements to your workflow design by helping you to find more efficient resource allocation methods and to swiftly discover bottlenecks. In short, Sumo Logic’s App for O365 helps you understand how members of your organization use Office to work together, better. Try it free for 30 days. Learn how Sumo Logic has raised the bar in data log analytics with this demo of our proprietary LogReduce technology.